The fascination and the pearl of mountainous Armenia is Sevan Lake, which is one of the world’s greatest high altitude fresh-water lakes. It is about 1900 m above sea level. The lake is of volcanic origin and is surrounded with mountains of 3000 m and higher. The beautiful landscape and the crystal water serve nice preconditions for excellent rest. The lake is also famous for its peninsula and medieval church complex built in 874. A marvelous scene opens in the northwestern part of Sevan Lake, where the peninsula towers over the transparent surface of the lake. 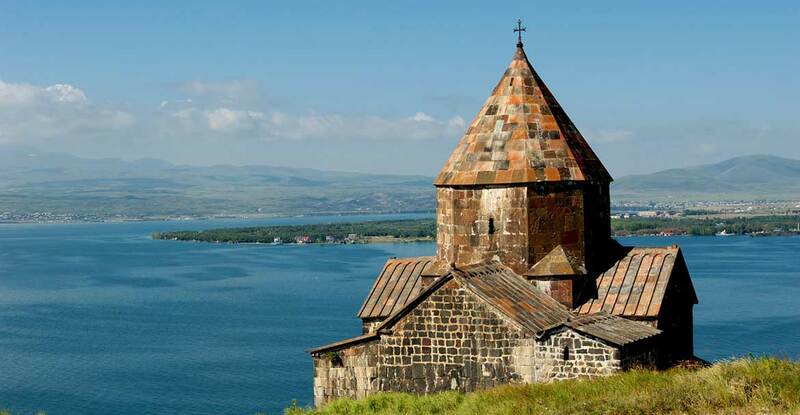 Sevanavank monastery was built on the peninsula in 874 by the order of king Ashot Bagratuni’s daughter princess Mariam. The silhouette of the churches against the background of the turquoise lake and blue sky casts unexplainable impression on the visitors.